So harvest is over ! Our Summer family of pickers are mostly homeward bound after a very busy and lucrative time here. They go home to their communities hoping for good snow as many of them work in the ski business in the winter. They were a good crew and we hope we will see most of them next year. We are still waiting to hear what the procedure for bringing in harvest labour will be next season. 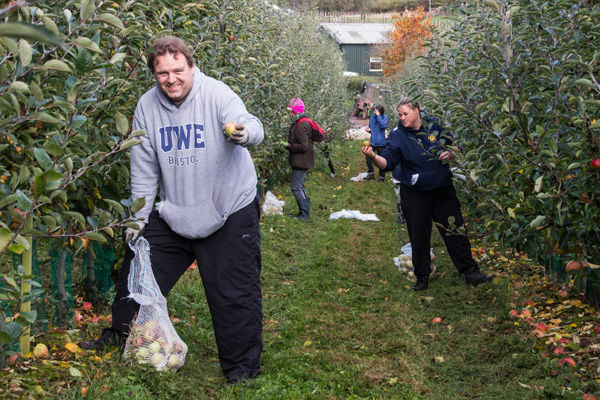 All Growers here totally rely on this skilled hardworking labour – whatever high ideals there are about jobs for local people it is an entirely impractical unrealistic suggestion. 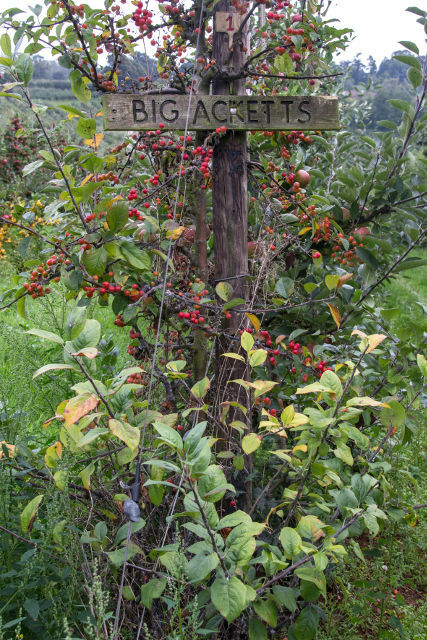 Of course we could all stop growing and just import from Europe….. The last Jazz and Braeburn were brought in last Friday. Then Bristol gleaners took a couple of tons away last week to distribute to Food Banks and through Fair Shares. 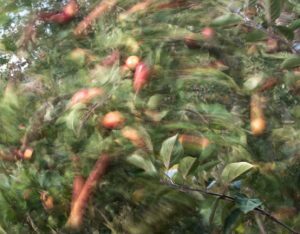 We now look forward to the next wave of gleaners : the thrushes, redwings and field fares will swoop noisily in chack chacking and clear every last bit of fruit from the trees and the ground and hopefully clearing away some bugs too. Amazing that our unpaid army of birds and pollinators together with soil, sun and rain plus some hard labour from us produce this wonderful crop! We are but caretakers and our aim is to be sustainable commercially and environmentally so we were particularly proud to have our efforts recognised by FWAG which stands for Farming and Wildlife Advisory Group. 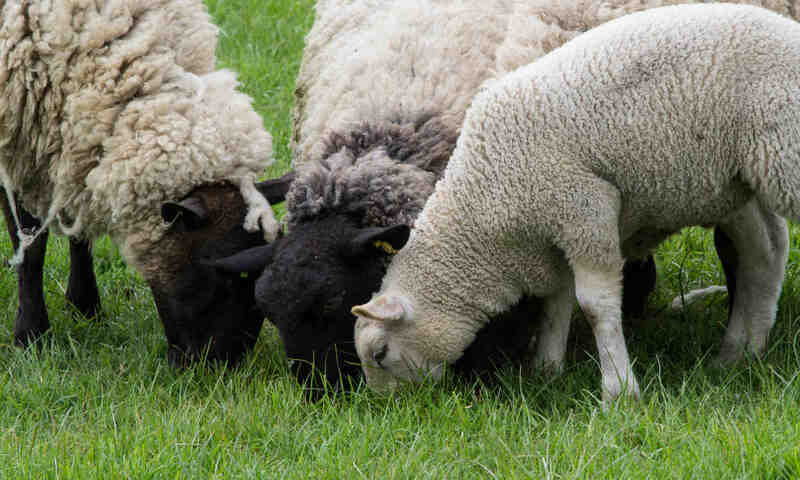 Their mission is to “promote and enhance the conservation of wildlife, the environment and the landscape in relation to modern agricultural needs”. 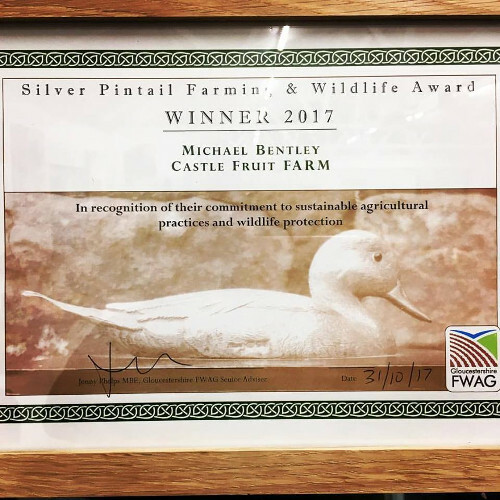 We won the Gloucestershire Silver Pintail Award in recognition of our commitment to sustainable agricultural practices and wildlife protection”. We now go on to the Regional Barn Owl Award and are galvanised to put into action some more practices which will benefit biodiversity here in our orchards. The big topic at this time of the harvest is why are there so many apples left on the trees ? The main reason is lack of colour or too small or too large! Why does this matter? Well in spite of what we all say about not minding, we all choose the colourful apple and we are particular about size ! It does not easily colour if the fruit is shaded, low on the tree or there is not enough sun, or the nights are not cold enough or the clone does not colour easily. As for size, it is hard to influence that except by judicial thinning and even that is not always with predictable results. So enjoy the harvest ! We are particularly enjoying sliced Comice pears with Stilton Bassett Blue Cheese. I use apples everywhere – in salad, in with the sausages, chopped on porridge or cereals or stuffed and baked and popped in the microwave. Serve with custard or cream ! All recipes and ideas welcome. Keep up your five a day.